Today, the National Academies of Sciences, Engineering, and Medicine have endorsed the development of the Electron Ion Collider, or EIC. The proposed facility, consisting of two intersecting accelerators, would smash together beams of protons and electrons traveling at nearly the speed of light. In the aftermath of each collision, scientists should see "snapshots" of the particles' inner structures, much like a CT scan for atoms. From these images, scientists hope to piece together a multidimensional picture, with unprecedented depth and clarity, of the quarks and gluons that bind together protons and all the visible matter in the universe. The EIC, if built, would significantly advance the field of quantum chromodynamics, which seeks to answer fundamental questions in physics, such as how quarks and gluons produce the strong force—the "glue" that holds all matter together. If constructed, the EIC would be the largest accelerator facility in the U.S. and, worldwide, second only to the Large Hadron Collider at CERN. MIT physicists, including Richard Milner, professor of physics at MIT, have been involved from the beginning in making the case for the EIC. 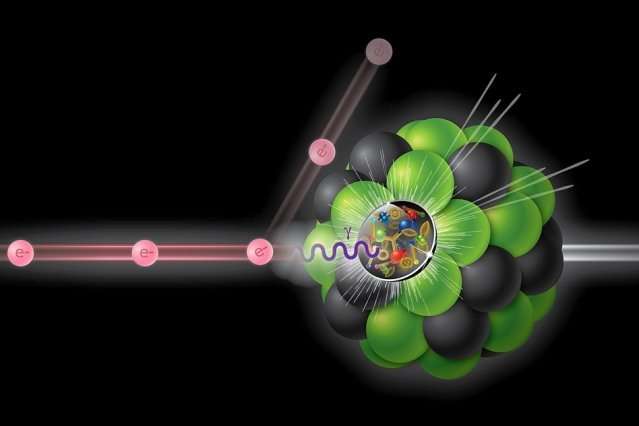 MIT News checked in with Milner, a member of MIT's Center for Theoretical Physics and the Laboratory for Nuclear Science, about the need for a new particle collider and its prospects going forward. Significant initial impetus for the EIC came from nuclear physicists at the university user-facilities at the University of Indiana and MIT as well as from physicists seeking to understand the origin of the proton's spin, at laboratories and universities in the U.S. and Europe. Over the last three long-range planning exercises by U.S. nuclear physicists in 2002, 2007, and 2015, the case for the EIC has matured and strengthened. After the 2007 exercise, the two U.S. flagship nuclear facilities, namely the Relativistic Heavy Ion Collider at Brookhaven National Laboratory and the Continuous Electron Beam Accelerator Facility at Jefferson Laboratory, took a leadership role in coordinating EIC activities across the broad U.S. QCD community. This led to the production in 2012 of a succinct summary of the science case, "Electron-Ion Collider: The Next QCD Frontier (Understanding the glue that binds us all)." The second issue is to understand the origin of the intrinsic angular momentum, or spin, of nucleons, a fundamental property that underlies many practical applications, including magnetic resonance imaging (MRI). How the angular momentum, both intrinsic as well as orbital, of the internal quarks and gluons gives rise to the known nucleon spin is not understood. And thirdly, the nature of gluons in matter—that is, their arrangements or states—and the details of how they hold matter together, is not well-known. Gluons in matter are a little like dark matter in the universe: unseen but playing a crucial role. An electron-ion collider would potentially reveal new states resulting from the close packing of many gluons within nucleons and nuclei. These issues are fundamental to our understanding of the matter in the universe. MIT theorists are carrying out important calculations using the world's most powerful computers to understand fundamental aspects of QCD. MIT experimental physicists are conducting experiments at existing facilities, such as BNL, CERN, and Jefferson Laboratory, to reach new insight and to develop new techniques that will be used at the EIC. Further, R&D into new polarized sources, detectors, and innovative data-acquisition schemes by MIT scientists and engineers is in progress. It is anticipated that these efforts will ramp up as the realization of the EIC approaches. It is anticipated that the U.S. Department of Energy Office of Science will initiate in the near future the official process for EIC by which the U.S. government approves, funds, and constructs new, large scientific facilities. Critical issues are the selection of the site for EIC and the participation of international users. An EIC user group has formed with the participation of more than 700 Ph.D. scientists from over 160 laboratories and universities around the world. If the realization of EIC follows a schedule comparable to that of past large facilities, it should be doing science by about 2030. MIT has a long history of providing leadership in U.S. nuclear physics and will continue to play a significant role as we proceed along the path to EIC. This project is too expensive to fund for a dying nation like America. It should be built in China. Stop building aircraft carriers you don't need and fantasy walls that no Mexican will pay for and there will be money for things like science.